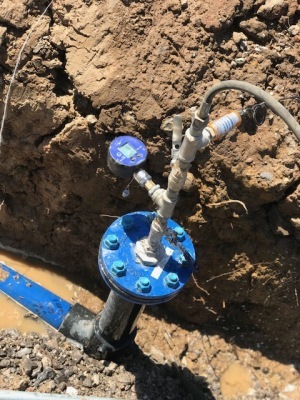 The purpose of pressure testing any new water main or service connection is primarily to identify its structural integrity for any leakage and to verify the performance of the new main or service laid for adoption and acceptability. Poor pipe laying procedures or workmanship during the construction of the main or pipe. Damage to any pipework, materials or fittings during construction. Non- conforming fusion joints or tapping bands or saddles, flange sets, or mechanical joint. Any manufacturing defects of Mains, Pipe, Materials or Fittings. S P Environmental Services LTD carries out hydrostatic pressure testing of all PE mains & pipe work that is tested using a TYPE 2 test and is carried out in strict accordance with IGN-4-01-03 – Issue 2– Pressure Testing of Pressure Pipes and Fittings for Use by Public Water Suppliers. Our engineers are all trained in pressure testing (EUSR approved) along side holding both a EUSR and CSCS card, we issue details RAMS prior to starting any work. We will issue certification and a produce a photographic report including highlighted sections that have been pressure tested upon completion. We work closely with all U.K water boards to ensure that their requirments are met in accordance with IGN-4-01-03 – Issue 2. Preferred date for the works? Additional info you think may be useful to us?